Aiming to start the postseason strong, the Waldorf University baseball team is set to square off against Mayville State University in the opening round of the North Star Athletic Association (NSAA) Tournament on Friday. The Warriors (18-35) take on the Comets (41-9), who are ranked No. 22 in the latest National Association of Intercollegiate Athletics (NAIA) poll, in a 1 p.m. matchup at Charlie Brown Stadium. Mayville State swept the four-game conference series during the season. The Comets won by scores of 9-0 and 6-3 on April 7 at Mayville, N.D. They completed the sweep, winning 14-0 in seven innings and edging Waldorf 4-3 in the series finale on the following day. This time around, the Warriors are seeking an upset. “To have a chance at beating Mayville State, we will need to have good pitching, defense and timely hitting,” Waldorf coach Joe Tautges said. The Warriors own a .290 team batting average this season, blasting 29 home runs and averaging 8.4 hits a game. Garrett Gillen leads Waldorf with a .376 batting average and ranks third on the team with 47 hits while collecting team-highs with 12 doubles and three triples. The sophomore second baseman from Blaine, Minn. has also provided a homer, 27 RBIs and 26 runs scored. Sophomore Jimmy Quirk is currently sporting a .344 batting average with 22 total hits, including five doubles. Quirk has gone deep with two homers while generating 18 RBIs. Michael Keeran, a first-team all-conference selection last season, has been steady at the plate with a .317 batting average. The senior outfielder and pitcher from Clear Lake is second for the Warriors with 53 hits, including 10 doubles and a triple to go along with 22 RBIs. Michael Keeran owns a .470 on-base percentage and leads Waldorf with 23 stolen bases in 28 attempts. Junior Miguel Castro is hitting .294 with two homers and 16 RBIs in his first season with the Warriors. He’s tallied 25 hits, including five doubles and a triple while crossing home plate 11 times. Riley MacDonald has delivered power at the plate during his debut season at Waldorf. The junior from North Vancouver, British Columbia has pounded out a team-high 54 hits and also leads the Warriors with 14 homers and 49 RBIs. MacDonald currently holds a .292 batting average and a team-best .578 slugging percentage while going for extra bases with 11 doubles and contributing 26 runs scored. Senior Ryan Villarreal has also added pop to Waldorf’s lineup, launching six long balls and producing 36 RBIs while hitting .289 on the season. Villarreal has a .493 slugging percentage and currently has 41 hits, including seven doubles and two triples. He’s scored 31 times on the year. Alex Remy has stepped up during his first collegiate season. The freshman from Algona owns a .274 batting average and has aided the Warriors with 23 hits. Remy has notched seven doubles and a triple while knocking in seven runs, swiping 10 bases and scoring 17 runs. Waldorf senior Bruce Mau enters the postseason hitting .271 with a homer and 19 RBIs. With 32 hits on the season, Mau has used his speed to pick up five doubles and two triples. He’s also contributed 29 runs scored. Senior Kellan Mick is sporting a .269 batting average with 14 hits and has driven in eight runs. Two of Mick’s hits are doubles and he’s been reliable at helping set the table for the Warriors with a team-high .479 on-base percentage. Joey Ponder has also added a boost for Waldorf. The junior third baseman from Mission Viejo, Calif. is hitting .268 with 22 RBIs. Ponder has 24 hits on the season with five doubles and a triple. He’s scored 24 times. Mitchell Keeran, who was the NSAA Freshman of the Year last season, continues to strengthen the order for the Warriors. The sophomore right fielder from Clear Lake comes into the tournament with a .266 batting average to go along with two homers and 32 RBIs. Mitchell Keeran ranks fourth on the team with 46 hits while providing 10 doubles, two triples, 11 steals and 33 runs scored. Junior shortstop Jacob Tedesco is hitting .250 for Waldorf with a homer and 27 RBIs. With 37 hits, Tedesco has two doubles, two triples and 24 runs scored on the year. Whether making plays in center field or serving as a courtesy runner, junior Eric Mallo has also been a difference maker for the Warriors. He’s currently second on the team with 36 runs. Trevor Bauer (4-5) leads Waldorf’s pitching staff. The senior right-hander from Twentynine Palms, Calif. has notched a team-high 56 strikeouts and holds team-bests with a 3.60 earned run average (ERA) while holding opposing hitters to a .218 average. Michael Keeran (5-7) has also been a key contributor on the mound, leading the team in wins and fanning 43 batters. The Warriors have also received starts on the mound from seniors Tony Manna (2-3), Dave Erickson (1-8), sophomore Nic Ray (2-6), Quirk (3-3) and junior Adam Kovash. As a team, Mayville State begins the postseason with a .317 batting average, 43 homers and ranks ninth in the country with 114 doubles. The Comets have slugged out 9.54 hits a game. Brady Nygaard has powered the Comets this season, amassing 64 hits with 14 homers and currently ranks third in the NAIA with 70 RBIs. He’s also 10th in the nation with a .808 slugging percentage, turning in 16 doubles and two triples with team-high 49 runs scored. Mayville State’s Nathan Walsh is sporting a .400 batting average and a .514 slugging percentage with 28 hits, including eight doubles. Walsh has also knocked in 16 runs. There are no easy outs in the lineup. Dondrei Hubbard is a threat at the plate, hitting .396 with 10 homers and 49 RBIs. With a .734 slugging percentage, Hubbard is second on the team with 61 hits and leads the Comets with 18 doubles. Another player to watch for the Comets is Jonathan Folena, who holds a .377 batting average with three homers and 46 RBIs. Folena has went for extra bases 18 times, drilling 17 doubles and a triple while recording a .558 slugging percentage. Andrew Hill, Drake Yoshioka, Jose Guzman and Taylor Lawrence have also damage for Mayville State with all four players currently hitting above .300 on the season. The Comets boast a pitching staff that ranks first in the nation with a 2.90 ERA and eighth while limiting opposing hitters to a .238 average. Jacob Torgerson (5-1) has helped guide the Comets on the hill with 24 strikeouts and a 0.98 ERA as he’s held opposing hitters to a .177 average. Zach Mahoney (7-2) has been impressive for Mayville State, delivering a team-high 99 strikeouts. Mahoney has a 2.14 ERA on the year and opposing offenses are hitting .232 against him. Camran Bonnema (5-0) has struck out 29 batters and also has a 2.14 ERA. Opposing hitters have managed a .231 average against Bonnema. Kody Rock (8-3) leads Mayville State’s pitching staff in wins. He’s punched out 87 batters, enters the tournament with a 2.99 ERA and has held opposing hitters to a .249 average. Conner Dinaro (6-1) also has had strong outings on the mound, recording 40 strikeouts, a 3.23 ERA and keeping opposing hitters to a .225 average. The Comets, who advanced to the NAIA National Tournament last season, locked up the No. 2 seed in this year’s NSAA Tournament following a 19-5 conference record. Second-ranked Bellevue University (47-7) captured its second straight NSAA regular-season championship with a 23-1 league record to secure the top seed in the conference tournament. Waldorf earned the No. 7 seed in the NSAA Tournament after finishing with a 9-15 mark in conference play and is in the Bracket B, which bodes well for the Warriors. Aside from Mayville State, Waldorf’s bracket includes third-seeded Valley City State University (25-23) and sixth-seeded Viterbo University (12-34). 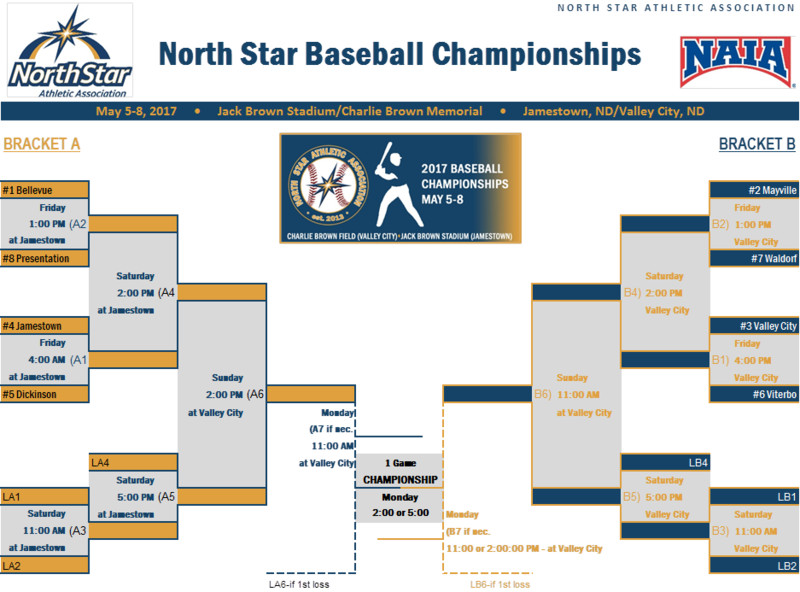 The NSAA Tournament features two four-team double-elimination brackets with the winner of each bracket facing off in a one-game championship on Monday at Valley City. All games are nine innings with a 10-run mercy rule after seven innings. There will be no mercy rule in the championship game. The NSAA Tournament champion earns an automatic bid to the NAIA National Tournament. If Bellevue advances to the NSAA Tournament title game, the Bracket B winner will receive the conference’s second automatic national tournament berth. Entering the conference tournament as an upset-minded team, Waldorf aims to get hot at the right time to make a postseason run in their quest for the ultimate goal of reaching nationals. Game 1: No. 8 Presentation College (14-35) vs. No. 1 Bellevue (47-7) – 1 p.m.
Game 2: No. 5 Dickinson State University (21-25) vs. No. 4 University of Jamestown (36-19) – 4 p.m.
Game 2: No. 6 Viterbo (12-34) vs. No. 3 Valley City State (25-23) – 4 p.m.
Game 3 (Loser’s Out Game): Game 1 Loser vs. Game 2 Loser – 11 a.m.
Game 4 (Winner’s Bracket Game): Game 1 Winner vs. Game 2 Winner – 2 p.m.
Game 5 (Loser’s Out Game): Game 3 Winner vs. Game 4 Loser – 5 p.m.
Game 6: Game 4 Winner vs. Game 5 Winner – 11 a.m.
Game 6: Game 4 Winner vs. Game 5 Winner – 2 p.m. Bracket A Game – 11 a.m. Bracket B Game – 11 a.m. or 2 p.m.
Championship Game: Bracket A Winner vs. Bracket B Winner – 2 p.m. or 5 p.m.